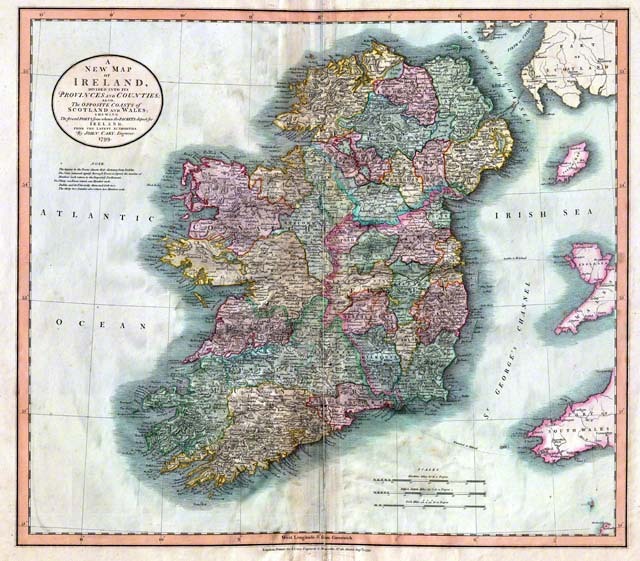 This map of Ireland, originally published by John Cary in 1799, is a high quality reproduction of a beautifully detailed map of the Emerald Isle, showing all provinces and counties. This large map of Ireland, originally published by John Cary in 1799, is a 22″x26″ high quality reproduction of a beautifully detailed map of the Emerald Isle, showing all provinces and counties. IMPORTANT: This is a high quality reproduction of an antique map and is NOT an original antique map. You can buy this map at our gallery in Clinton, MA, at Tinker’s Cart, also in Clinton, MA, or right here. Each map is printed on high quality archival mat paper using the same fine art reproduction process we use for our giclee prints.